[Rich Goldner] sent in this walkthrough of the Foothills Community Workshop in Granite Falls N.C. Taken during their open house, [Rich] gives us the grand tour showing off the different areas including the HAM station, electronics station, collective work areas, the machine shop, and wood shop. Though you can see some of the areas are still being put together, their space looks really cool. They have about 3,500 square feet in an old mill. They started with four very enthusiastic individuals who rented the space and set out to build a workshop. Since then, they’ve added 17 more people. Not too bad considering the town population there is only about 5,000. Nice to have all of that room to work with. The electronics bench sure seems quite minimal, though. One oscilloscope for the whole place? Really? Up to now we have spent months on the build-out of the space. Originally, we had nothing, no light, no power, no rooms. The only thing we worked on was the build-out. Now we get to do the fun projects. We will eventually fill the room with electronics stuff. Imagine my surprise when I saw my old buddy Rich show up on HackaDay. Looks like you’ve got a great space. I’m jealous. How’ve you been. Drop me a line. I am the one organizing the electronics shop and the ham radio station. Yes, there is only one 350Mhz scope on site, but it is now all that we need. If we offer a scope workshop, I have 3 more standard scopes and 2 digital storage scopes that can be brought in. Other members also have scopes, so that is not a problem. The electronics area is concentrating on embedded systems using MPU’s (PIC, Propeller, AVR, ARM, and others), CPLD’s and FPGA’s. We have a Pace SMD rework station and will be building a reflow oven. We are a bit short on analog at the moment. We do not have any spectrum analyzers that go over 150MHz. However, the biggest shortage is components and storage. We are working on both. Realize that we had to wire the entire area. There was no power in the main room until December. Now that is an awesome hackerspace. A machine shop AND a wood shop. Holy crap! But it’s in the middle of North Carolina, about 1,000 miles from here. I am the guy in the blue shirt as you walk in the front room. All the tables in the front room are for electronics, but we had them cleaned off for project boards, bots, etc. catering to BGA projects is a bad idea.. even the ones you can get without buying big wholesale, you have to buy and sign NDA on ROM flashing resources. This is why you don’t see many projects with FPGAs and APUs in them.. I agree about the BGA. I do have contacts locally that can handle BGA, but FCW is concentrating on the smaller devices, primarily PLCC packages. We’ll eventually work on a way of doing BGA in house, eg with an add-on to the PACE system. I am quite envious of your opportunities and impressed by your set-up. How have you financed your installation? Through state/city support or by private donations? Are you all volunteers? 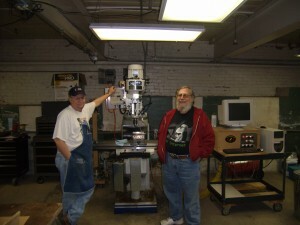 The hackerspace was financed by it’s members. The original charter members each made a cash contribution to get it started. Over time most members have contributed beyond the monthly dues. We have very commited members. They have, in total, contributed thousands of dollars. We also have a 501(c)(3) working its way through the IRS. We have several retired and current college and HS educators who have experience with grants and plan to “hit the ground running” when the 501(c)(3) is complete. The 501(c)(3) has been approved, so we are now starting to look for grants. Foothills Community Workshop is a non-profit corporation and has no stock holders. No one “owns” it or makes any money from it. All of the board of directors and all of the officers are members. No salaries are paid to anyone. It is strictly a volunteer group. The members pay monthly dues for it’s upkeep, maintenance, etc. don’t you mean organization? who owns the building and tools? No, I actually mean corporation. NC allows you to set up a non-profit corporation with no stock holders. The space is rented. Some of the tools were donated to us and, therefore, FCW owns them. Other tools are leased to us at one dollar a year by individual members. Leasing is important rather then lending them to us. If the tools are lent to us they ae not covered by our insurance since they are not our property. However, our insurance does cover leased equipment. Wow that is a nice space. What do you guys pay for rent? I don’t think our landlord would like us to make that information public. He has been very good to us and has given us an outstanding deal. Let’s just say that we pay less per year than a lot of hackerspaces pay per month. Nice! love to see it when it hasn’t been all tidied up for the open house. Looks great. Awesome space!!! Just down the road from me. I need to come visit it! We would love to have you visit. What city are you in? We have scheduled meetings (open to all) every Saturday at 3:00pm and every Tuesday at 7:00pm. At any other time give me a call (828-351-HACK) and we can make arrangements for a visit at any time that suits you. Are you taking on new members? If so, what are the particulars. I live in Hudson, and am very excited to find you.